A few months ago, I noticed that the Phone app was gone from my iPhone’s home screen. I honestly do not remember moving it—one day, I simply relegated it to a folder, alongside several other pieces of Apple software that I rarely used. The problem wasn’t so much that I didn’t make many phone calls, but, rather, that the phone app was no longer the most convenient way to do so. In its place, I instead installed Launch Center Pro (App Store Link), a $5 app developed by Contrast (formerly App Cubby). The app just received a major update to version 2.0; it requires iOS 7 and is compatible with all iPhone and iPod touch models that support Apple’s latest mobile operating system. 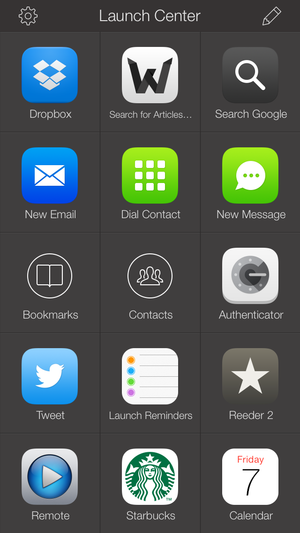 Launch Center Pro is like a quick dialer for your apps. On the surface, Launch Center is, essentially, a speed dialer for apps. Its working principles are similar to that of iOS’s home screen, except that, instead of launching an app when you tap an icon, you perform a particular action. 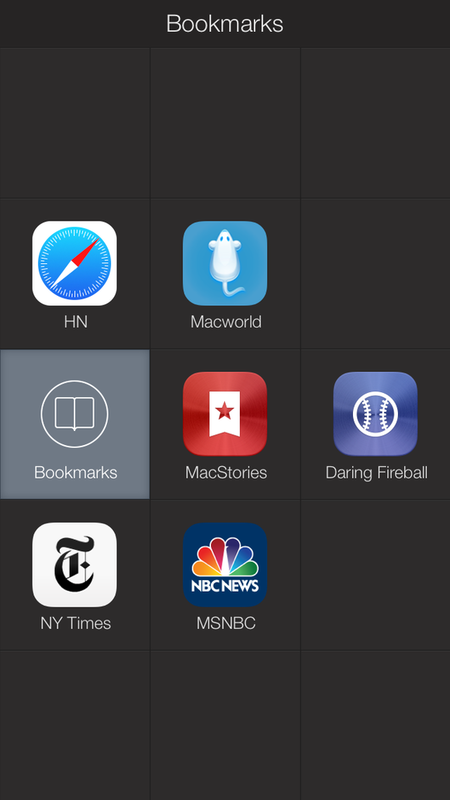 For example, instead of just “opening Safari,” which is what you would normally do by tapping the app’s icon on the home screen, you can open Safari and navigate to the Macworld homepage, all with a single pre-programmed tap. Despite its apparent simplicity, Launch Center’s focus on doing things instead of just launching apps has a transformative effect on the way you use your phone. Once you’ve set up the actions that fit your particular needs, Launch Center makes everything from browsing the Web to placing a phone call much more efficient without making it more complex—you just tap to get right to what you wanted to do. Groups allow you to create alternate grids of actions and can be activated using a simple tap-swipe action. Launch Center Pro’s main interface consists of a simple grid that can be populated by actions and groups; the latter are really just alternate action grids that can be activated by a tap-and-swipe mechanism. Unlike the home screen’s multipage setup, these groups can easily be triggered by muscle memory alone, without even having to look at the screen. Launch Center does not support nested groups—which, frankly, is just as well, since they would needlessly complicate its beautifully simple workflow. During normal use, pretty much all of a user’s interaction with Launch Center Pro takes place in this screen. You activate an action by tapping it, or by tap-swiping into a group, and the corresponding app is launched. For some tasks—such as when you want to run a query against a search engine or dial a phone number—the software will first prompt you to type some text first, but its UI is otherwise built to be quickly accessed, used, and dismissed. The interface supports three different themes: dark and light are designed to complement iOS 7’s flat design sensibilities while a “classic” aesthetic features a gray gradient that would likely be more at home in previous versions of Apple’s mobile operating system. I found the light theme to be a little hard on the eyes, both because of the relatively low contrast and because most apps are designed to look good against a dark background; the icons sometimes get completely lost when they are displayed over a white backdrop. The app comes with built-in support for hundreds of apps—from popular favorites like Instagram to some of the most obscure pieces of software. For more complexity—and more power—you have to descend into the app’s editing mode, where you can configure the various actions as well as specify their layout on the grid. Launch Center Pro comes with built-in support for many system actions, including initiating SMS messages, making phone calls, and so on. The app also supports the use of custom URLs to interact with third-party software. These work much like the URLs you use to access a website, except that, instead of opening a browser, they launch a specific app—and sometimes even a particular part of that app. For example, Instagram provides its own instagram:// scheme to allow jumping directly to its camera functionality, or to view a user’s feed. 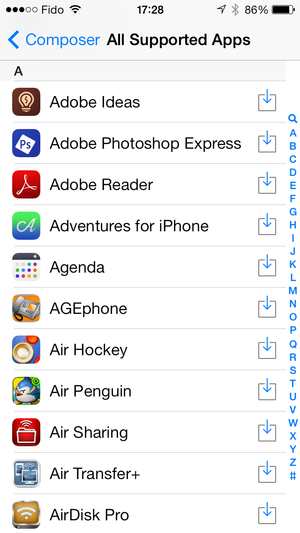 Custom URLs are widely used by iOS developers, but they are not usually exposed to the end user; luckily, Launch Center Pro comes with an Action Composer that lets you tap your way through a list of available URLs for hundreds of apps, making the process of coming up with the actions that you need simple and straightforward. Even better, the ever-growing list of supported third-party software is automatically updated over the Web, so that you can always get your hands on the latest updates. The utility of an app like Launch Center Pro is primarily dictated by two factors. The first, quite obviously, is whether it supports the apps you use. Considering the sheer number of third-party programs offered, this is only likely to be a problem when dealing with very obscure apps that have been abandoned by their developers. Much more challenging, on the other hand, is conditioning yourself to use Launch Center Pro instead of hunting-and-pecking your way through your home screen. Success here depends on having enough patience to set up your actions and then learning to make the app your go-to place for anything you do. The developers have obviously done their best to make doing so as simple as possible, but overcoming the inertia of having to learn something new is entirely up to you. It would be wrong, however, to dismiss Launch Center Pro as an app only for “power users.” With a little discipline, it can have a pretty significant impact on anybody’s productivity, regardless of how technically savvy they may be. Besides, even if you are not the type of person who likes to customize every last aspect of your mobile device, being able to access a wide range of functionality from one interface can speed up everything from calling up the office to visiting your favorite websites. And it’s all from the comfort of a single app. 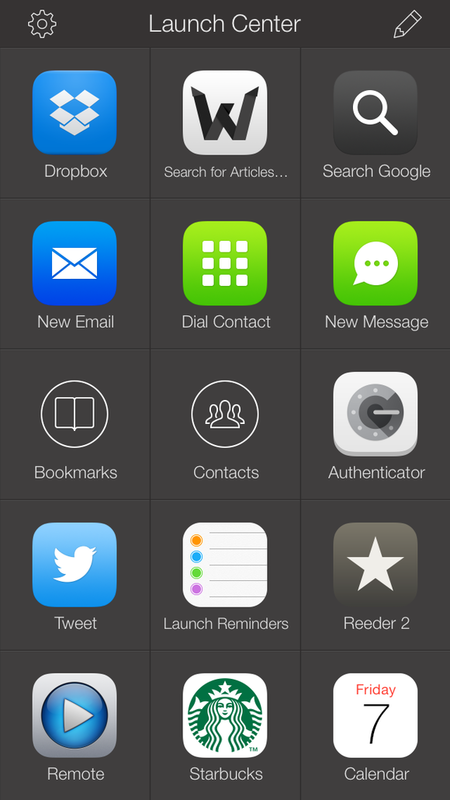 Launch Center 2 brings iOS 7 design sensibilities to the popular launcher app, with a refined interface and many improvements that increase productivity and make setting actions up easier.